So we got in to SC today and I was able to be with Kendra and Bobby from 9 till 1am when he finally fell asleep. His sleep clock is flip flopped and you can tell he gets so bothered with the other monitors in the PICU beeping. I brought him some cars and a sticker book things to keep a 2yr old busy but not too busy! 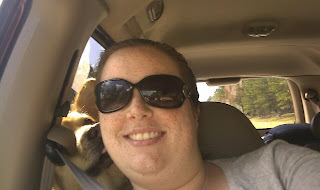 This is me and Goldie riding in the car. They are such great road dogs! Hope you have a good visit! I love the pic! Here for Bingo. What a beautiful smile you have. I hope your bff's son is doing well and that he heals fast. Thank you. He is doing very well even got out of bed and played. I hope he is doing well. He is such a cutie!